Southeast Asia is the land of ancient temples, tropical beaches, metropolitan cities, mountain villages, and an endless supply of cultural experiences. This 3 month Southeast Asia itinerary allows you not only to see the highlights of this part of the world, but to also to fully immerse yourself in the local culture. 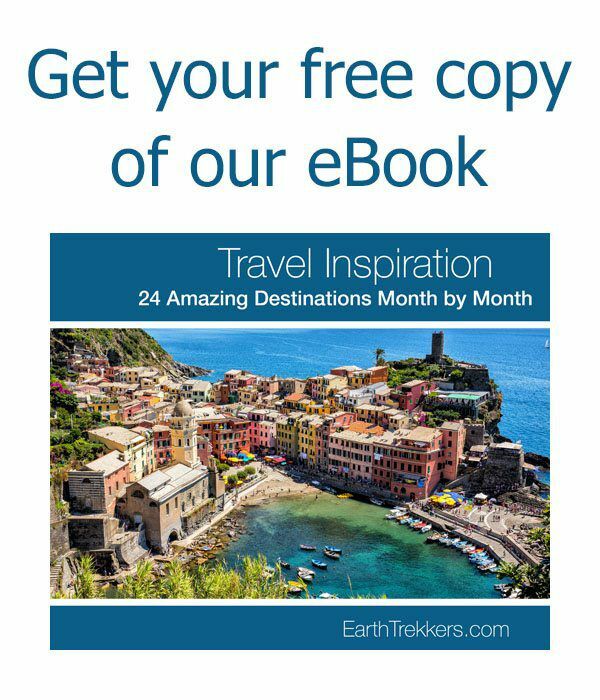 On this Southeast Asia itinerary, explore the temples of Siem Reap, go island hopping in Krabi, drift down the Mekong River in Laos, visit the big cities of Bangkok and Ho Chi Minh City, cruise Ha Long Bay, cycle among the temples of Bagan, tour the floating markets in the Mekong Delta in Vietnam, and spend several days in Luang Prabang, a wonderful French town in Laos. This trip will leave you with memories and stories to tell for the rest of your life. Technically speaking, the term Southeast Asia refers to a subregion of Asia, bound by the Indian Ocean to the west and the Pacific Ocean to the east. And even though it’s a subregion, this area is still massive. There are two distinct regions of Southeast Asia. The mainland, also called Indochina, includes Myanmar, Thailand, Laos, Cambodia, and Vietnam. The maritime region includes Indonesia, Malaysia, Singapore, the Philippines, Brunei, East Timor, and the Andaman and Nicobar Islands. 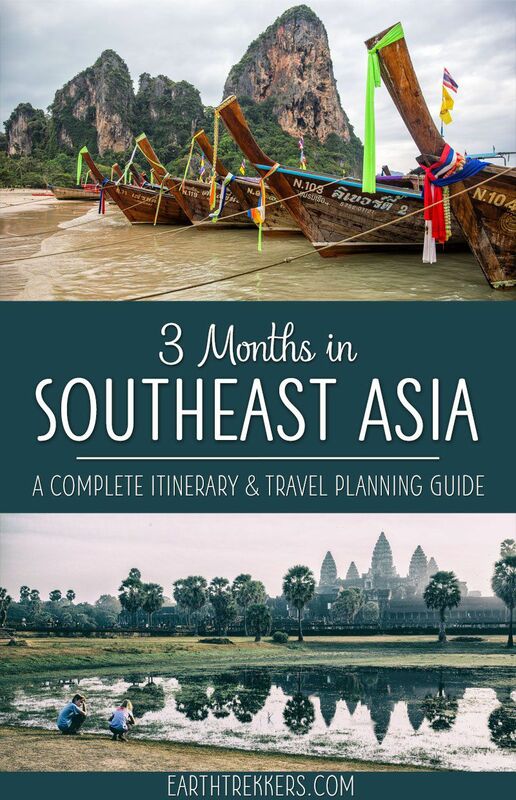 This 3 month Southeast Asia itinerary only includes the mainland countries of Myanmar, Thailand, Laos, Cambodia, and Vietnam. What is Your Traveling Style? When planning a big trip like this one, there are two schools of thought. Do you like to plan things out in advance or do you want to book your first flight and let the rest of the trip fall into place? Do you prefer to go with the flow? As you do your research, you will read the advice of fellow travelers to not plan out your full itinerary. By having a loose schedule, you have the freedom to change your itinerary, stay longer in place that you fall in love with, or leave a place right away if you don’t like it. This also gives you the flexibility to explore new places that you learn about while you are traveling. There are downfalls of not planning ahead. It may be difficult to find hotels with availability at the last minute (if you are traveling during peak season). Also, trains and planes can get booked and you won’t get a seat on the day you want (this happened to us in Thailand). But for some people, this is worth it to have the freedom of traveling without a set itinerary. Are you the type of traveler who likes to have things planned in advance? We fall into this category. Tim and I are Type A planners, it’s just who we are. We like the idea of having hotels and transportation booked ahead of time…it’s one less thing to worry about while traveling. We just show up and check into our hotel. Trains, planes, and automobiles are booked so we don’t have to figure out how to get from point A to point B. Without these “hassles,” we feel like we enjoy our time spent in each spot just a little bit more. 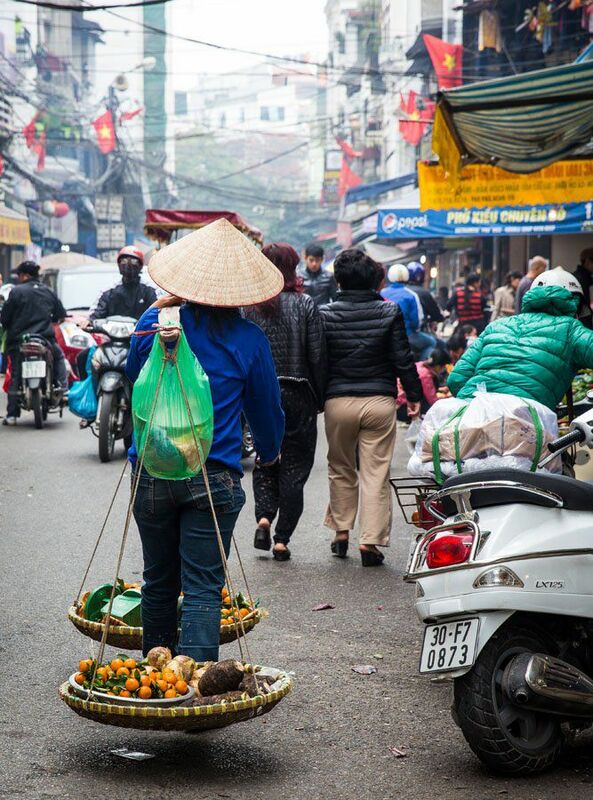 Of course, there have been times we wished we could have stayed longer in spot (Hoi An, Vietnam falls into this category) but our pre-booked flights or trains locked us into a set itinerary. 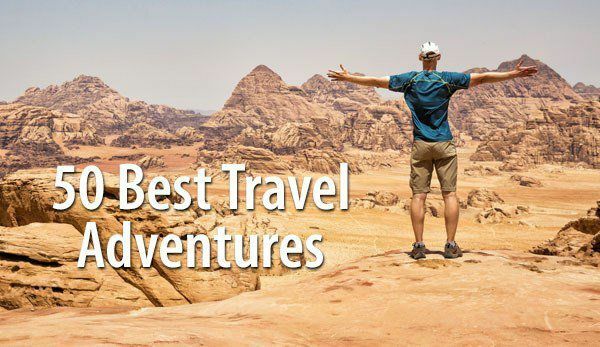 You can combine both of these travel styles by laying out a basic itinerary, booking your main flights or trains in advance, and having your first one or two hotels in each country reserved in advance. Use this itinerary as the basic building block for planning your travels through Southeast Asia or follow it exactly as it is if you like to have things planned out. Before our trip to Asia, I spent a lot of time researching routes through Southeast Asia and I think this plan works very well. Using a variety of transportation methods, you will weave your way through Southeast Asia, hitting the highlights and a few off-the-beaten-path destinations along the way. This is almost our exact itinerary through Southeast Asia. I did change a few things, just to make it easier to get visas or to add time in spots that we really enjoyed. Arrive in Yangon, Myanmar. It may take a day or two to adjust to the time change, depending on where you are coming from. We booked our bus tickets while in Yangon. 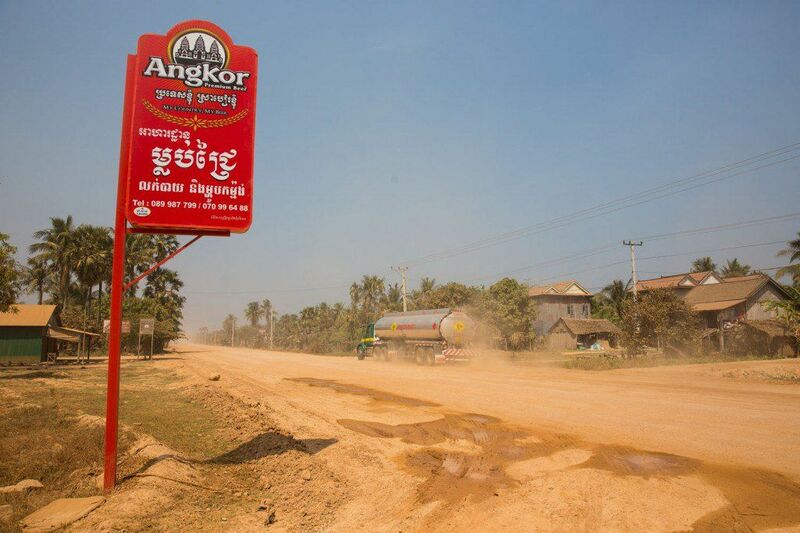 To get from Yangon to Bagan, you can take an overnight bus or you can take a daytime bus directly to Bagan. Either way, the journey takes 9 to 12 hours (in our experience, it took 10 hours). Make sure you book a VIP bus. On a VIP bus you get air-conditioning, reclining seats, and we even had our own TV screen with movies. We used Elite Express and had a great experience (it was our best bus ride during our 9 months in Asia) but JJ Express also gets great reviews. Tickets cost approximately $18 per person. For most travelers, Bagan is the highlight of a trip to Myanmar. 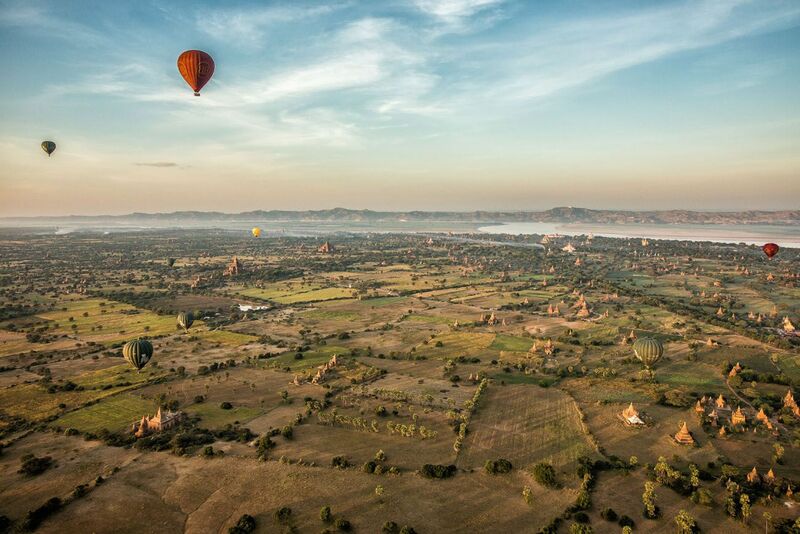 This is the land of thousands of temples, and what better way to explore them than by bicycle or hot air balloon? We booked our bus through our hotel. Again, make sure you book a VIP bus. It takes about 5 hours to travel from Bagan to Mandalay. One day in Mandalay is enough time to see the main sites. 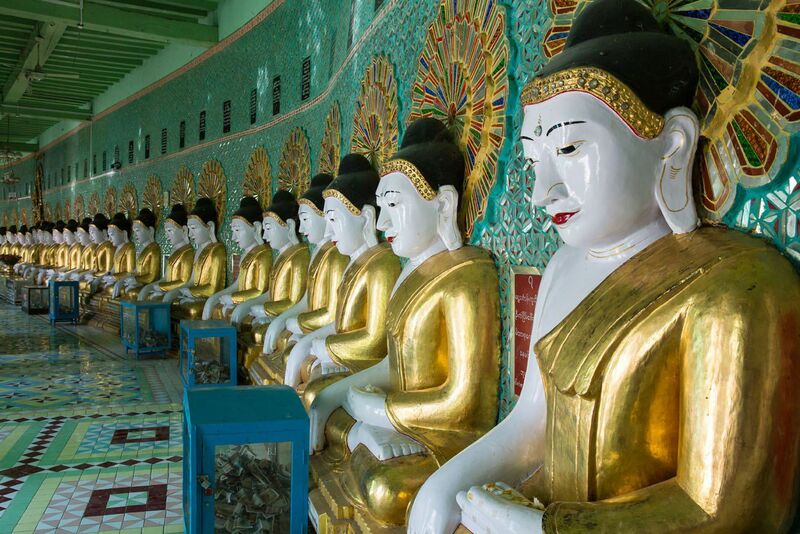 Mandalay does not have the charm of Bagan or the same cool vibe of Yangon, but there are a few very worthwhile places to visit. 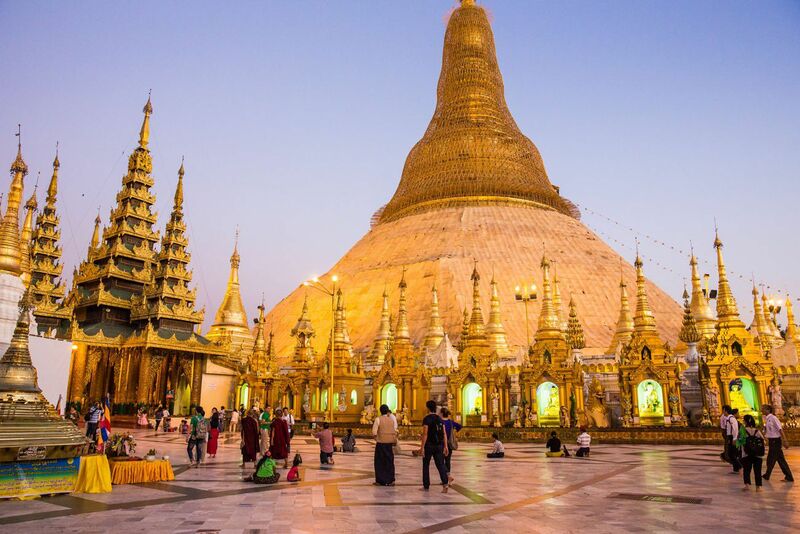 Should you travel to Myanmar now? Recently, Myanmar has been making the news again…mass atrocities, ethnic cleansing, people fleeing to Bangladesh for safety. Is it ethical to visit Myanmar right now? Some people argue that traveling for pleasure to a country that is in the midst of ethnic cleansing is morally wrong. Others argue that tourism contributes to the local economies, something that is much needed in Myanmar right now. The choice is up to you. If you don’t feel comfortable visiting Myanmar, start your tour of Southeast Asia in Bangkok, the next leg of this itinerary. Bangkok is Thailand’s largest city. This is where modern malls and skyscrapers collide with old floating markets and golden temples. 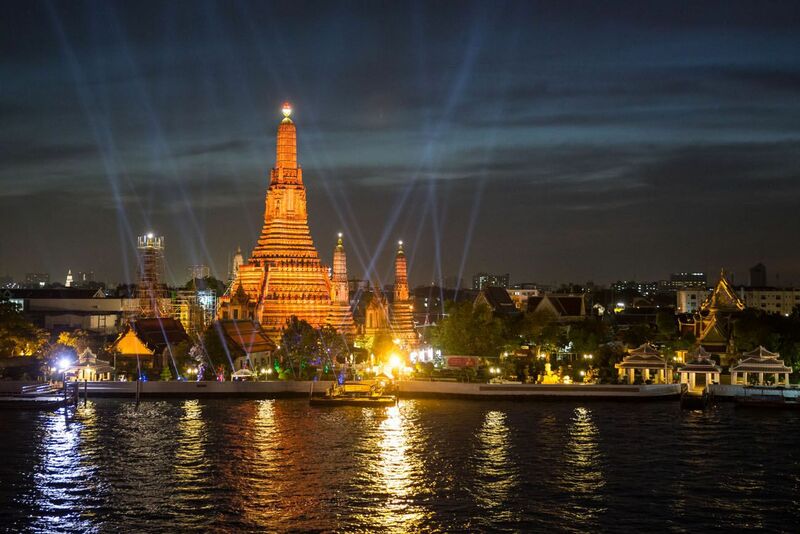 In Bangkok, explore the temples, go shopping at Chatuchak Market, get your fill of street food, and explore the city by tuk-tuk. Looking for a slice of tropical paradise? In Thailand, there are lots of gorgeous beaches and islands to choose from. 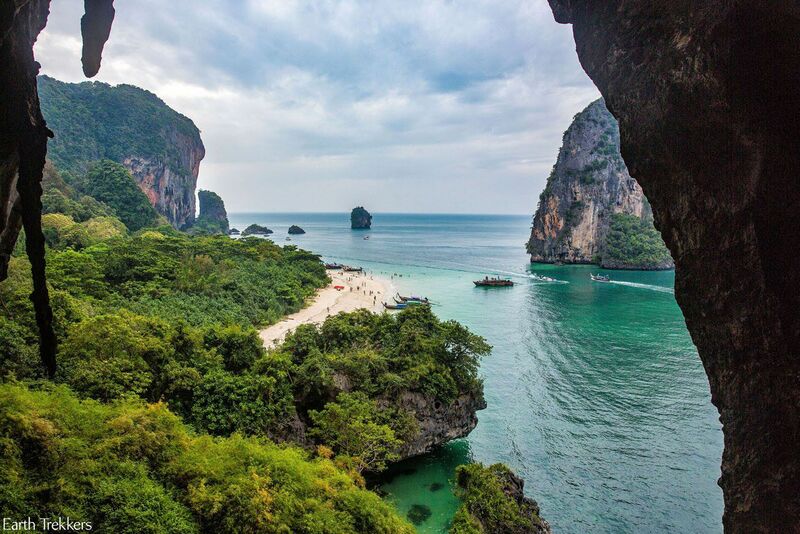 Ao Nang is a great place to stay, with easy access to Railay Beach and Phra Nang Cave Beach, and lots of options to day trip out to the Phi Phi Islands and a handful of tiny Thai islands. If you want to learn how to rock climb, this is one of the best places in the world to learn. Ten days is a lot of time to spend in Krabi, although we spent nine wonderful days here and were glad to have so much time. If the idea of sitting still in one spot for so long doesn’t appeal to you, you can spend several nights on Ko Lanta. 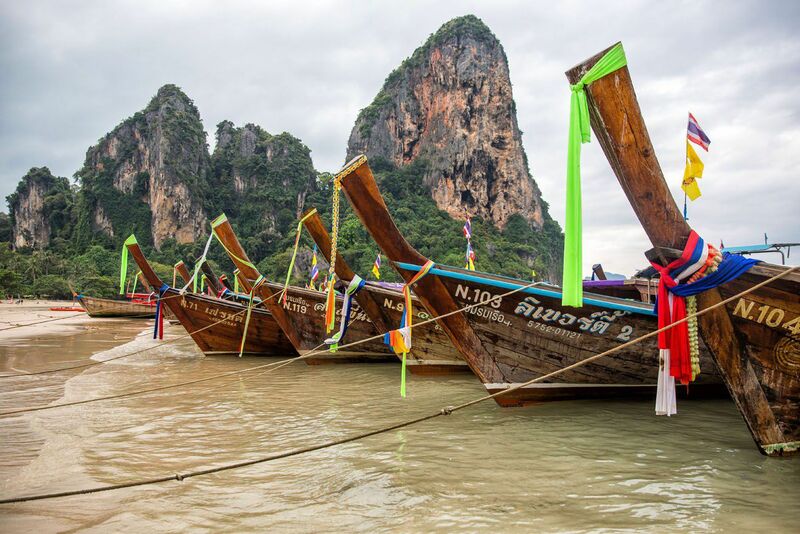 Getting to Krabi: The easiest way to get to Krabi from Bangkok is to take a direct flight. Flights last 1 hour 10 minutes and you can get round trip tickets as cheap as $30. Fly back to Bangkok. From here, you will start a road trip up through Thailand towards Chiang Mai, stopping at several ancient cities along the way. 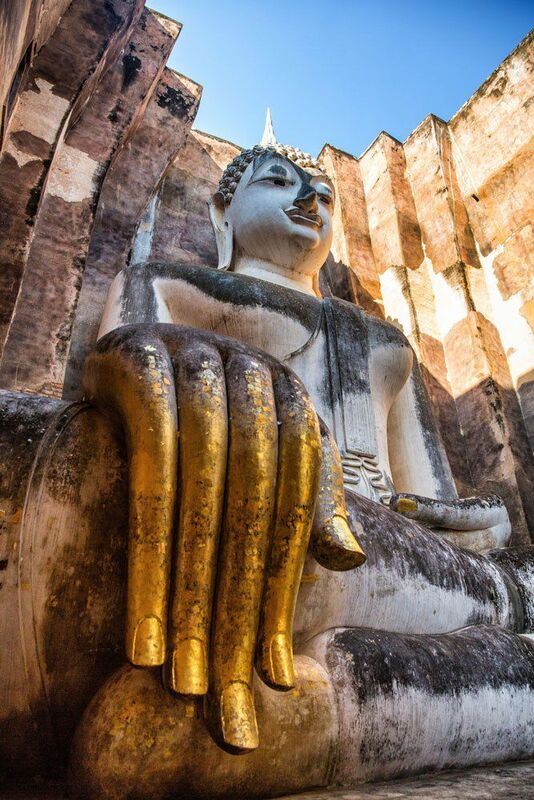 Here’s an interesting fact: Ayutthaya was the largest city in the world in 1700. Merchants sailed here from Europe, India, Japan, China, and the Middle East. In 1767 it was attacked by the Burmese and almost completely destroyed. Now, just a handful of buildings and temples remain. To get here from Bangkok, you can drive, hire a driver, take the bus, take the train or visit Ayutthaya on a tour. We spent the night in Ayutthaya and the next day we traveled to Sukhothai. To travel between Ayutthaya and Sukhothai, take the train, bus, or hire a driver. Sukhothai may not have been as large or as grand as Ayutthaya, but the temples and ruins are a lot more interesting to visit. Giant Buddha statues stare down at you with half-lidded eyes. The historical park is flat with wide, paved roads, perfect for exploring by bicycle. Travel from Sukhothai to Chiang Mai by bus, train, or private driver. 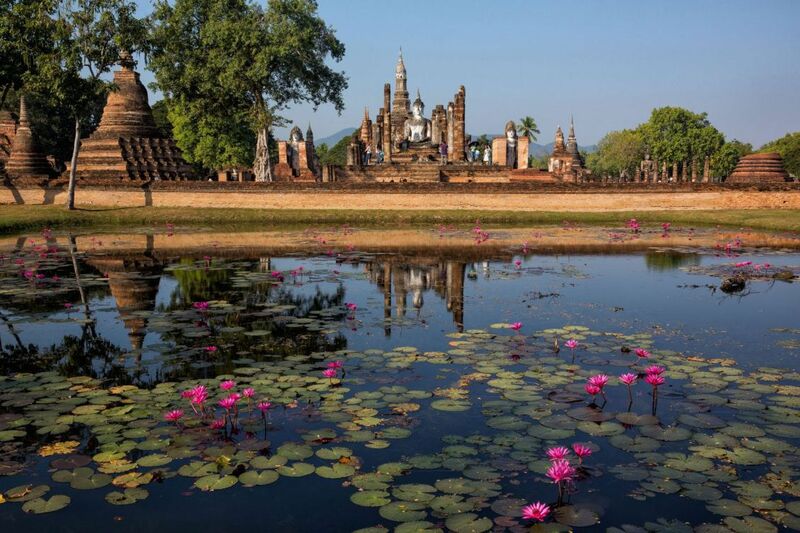 Chiang Mai, located in northern Thailand, is a vastly different experience than Bangkok or Krabi. Chiang Mai offers a mix of outdoor adventure with cultural experiences, food tours, and a chance to get up close with elephants. Chiang Rai is a smaller, less exciting version of Chiang Mai. The main reason for coming here is to visit the White Temple. 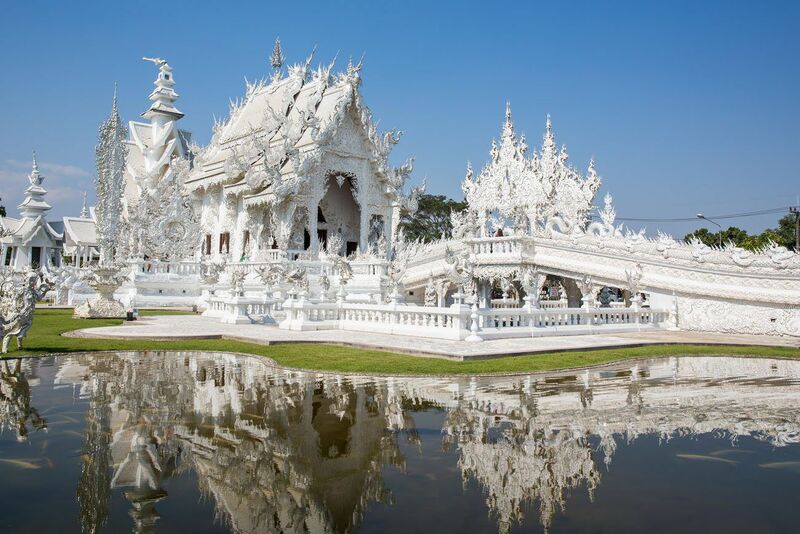 Take a bus from Chiang Mai (about 3 hours), get settled, and on your second day in Chiang Rai, visit the White Temple. Cycling through the countryside in this part of Thailand adds a little adventure to the experience and makes it even more memorable. For us, the two-day journey down the Mekong River in Laos was an experience that was unexpectedly awesome. The journey starts on the Thai-Laos border. 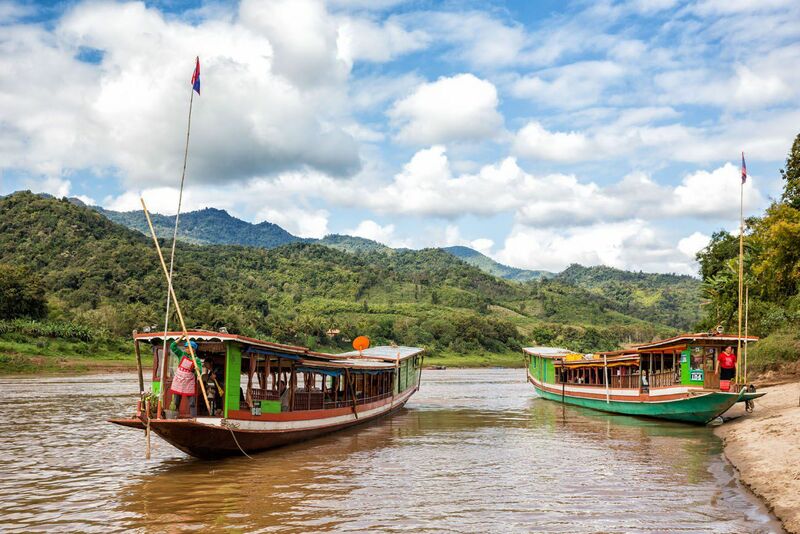 For two days, you drift down the Mekong River on a “slow boat” while the gorgeous, mountainous landscapes of northern Laos pass by. The journey is punctuated with a one night stay in Pakbeng. On the afternoon of day 2 you arrive in lovely little Luang Prabang, a French town in the middle of the Laos jungle. The entire town of Luang Prabang is a UNESCO World Heritage Site. French cafes, small shops, hotels and hostels, and a nightly market makes this one of the coolest small towns in Southeast Asia. Siem Reap, Cambodia is one of the most amazing spots to visit in Southeast Asia. 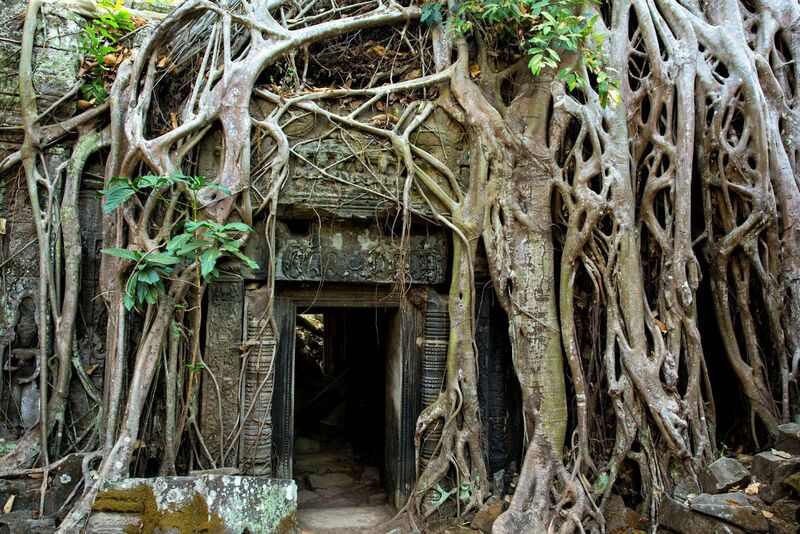 Not only can you visit ancient Angkor Wat, but there many more temples and ancient palaces to visit. Seven days may sound like a long time, but this gives you plenty of time to explore the temples and get some much needed downtime. To get here from Laos we took a flight from Luang Prabang to Siem Reap. Our other option was a series of two to three buses over the course of two days to get between these two cities. Hmmm…a quick flight or a 36 hour bus journey…for us the decision was a no-brainer. Phnom Penh is the capital city of Cambodia. Go to Phnom Penh to visit its gilded temples, stroll the waterfront promenade, but to also get a glimpse of Cambodia’s dark history. 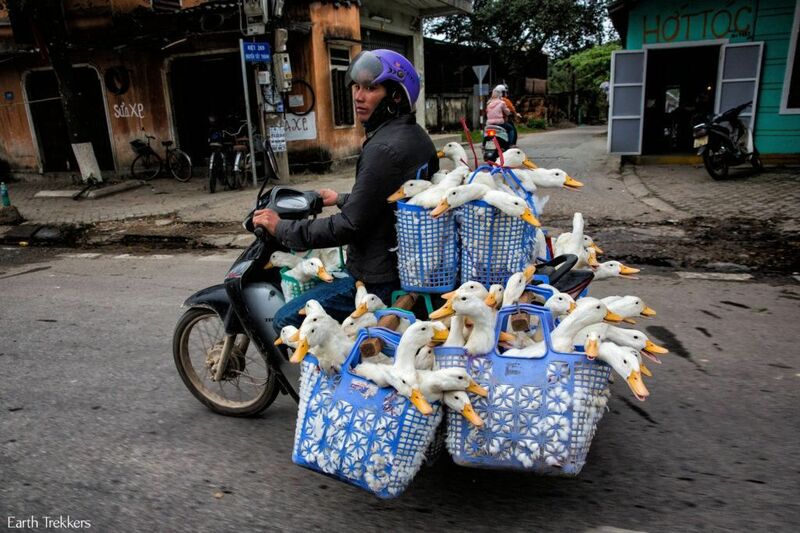 Kampot is a small town on the coast of Cambodia. It’s a great spot to unwind and relax. While you are here, consider renting motorbikes to explore nearby spots. From Kampot, you will cross overland into Vietnam and then take a ferry to Phu Quoc Island. Phu Quoc Island is a tropical island that sits off of the coast of Cambodia, even though it is part of Vietnam. This is a place where it’s worth spending extra money to stay at a nice resort. We stayed at a budget hotel and had a budget experience. If you stay at a mid-range or nicer resort, you will have a prettier, cleaner beach and a better experience. From Phu Quoc, take the ferry back to the mainland and then travel by bus to the Mekong Delta. There are several towns to stay in but Can Tho gets our vote. 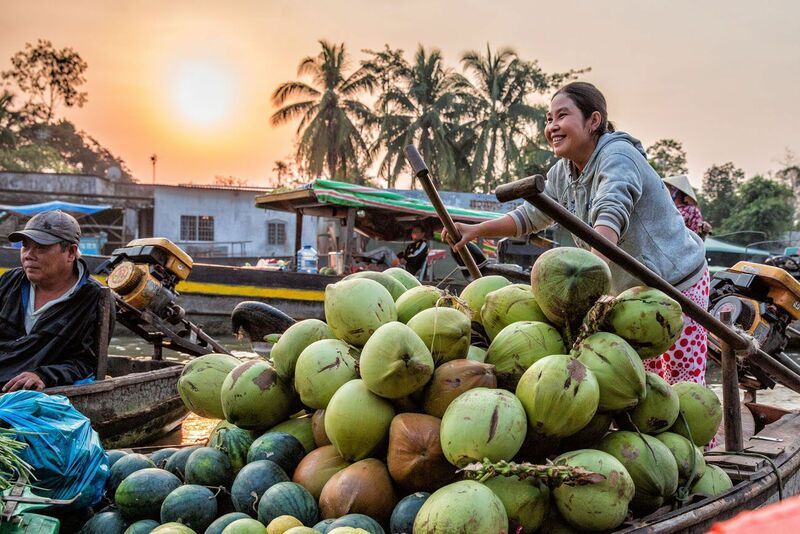 From here, you can arrange tours into the Mekong Delta and Can Tho is well connected by bus to Phu Quoc and Ho Chi Minh City. HCMC is Vietnam’s largest city. This is a city where modern skyscrapers touch the sky, luxurious shopping malls cater to the rich, and where the streets are a sea of motorbikes. It’s a hot, steamy city with several important places to visit, especially if you want to learn more about the Vietnam War. 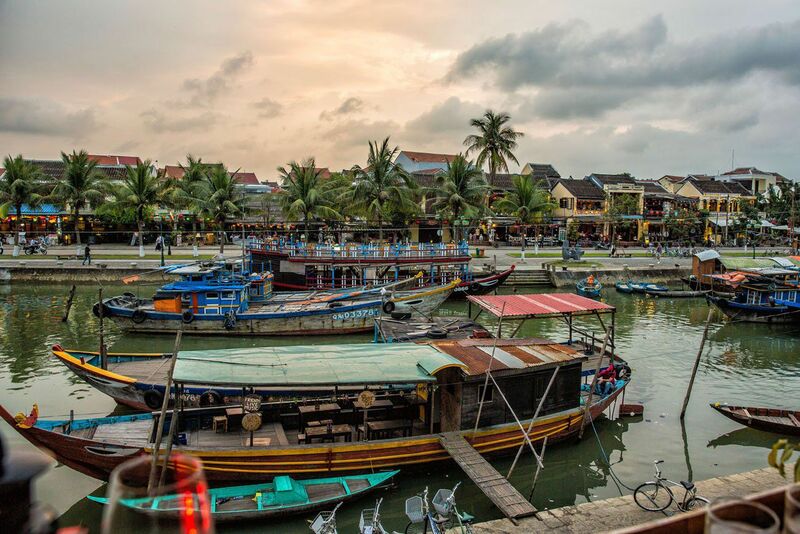 It’s easy to fall in love with Hoi An. 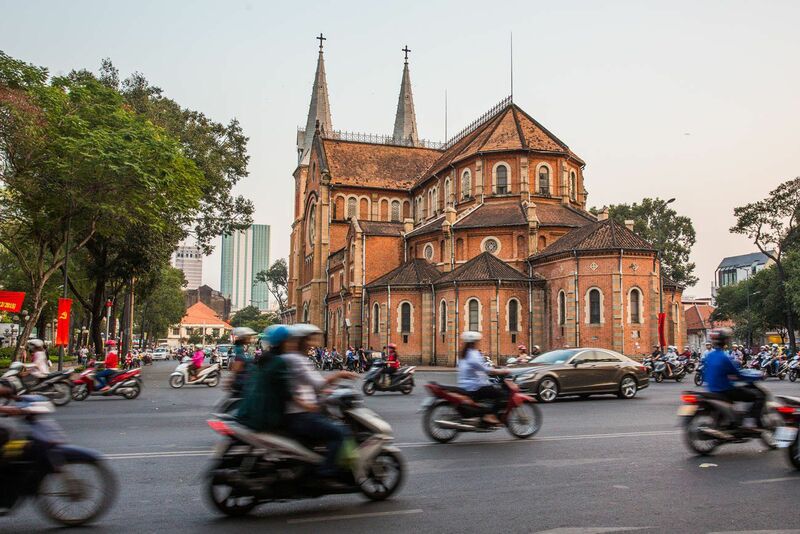 With its charming shopping streets, ancient architecture, great restaurants, and nearby beaches and rice fields, this may become one of your favorite spots in Vietnam. When traveling from Hoi An to Hue, you can visit My Son Holyland, Marble Mountain, Hai Van Pass, and Lang Co Beach, turning a day of travel into a really cool road trip. 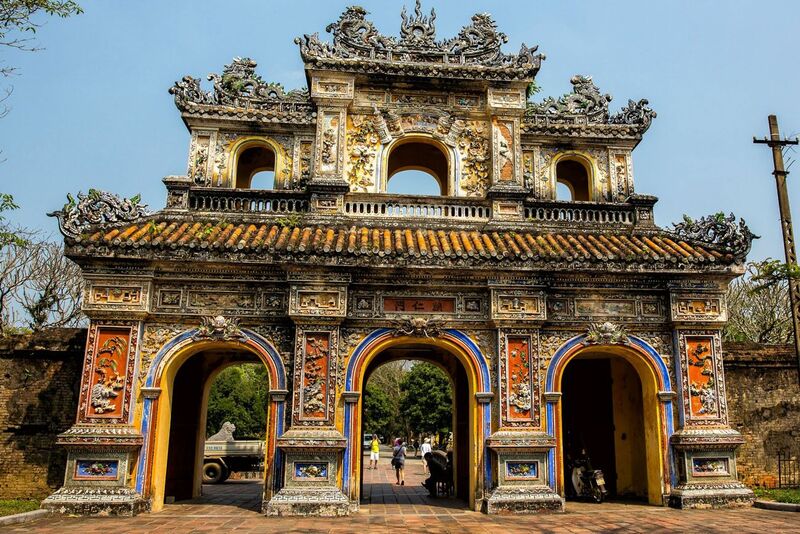 Hue was the capital city of Vietnam until 1945. The Imperial City and palaces and tombs along the Perfume River attract thousands of visitors here every year. In Hanoi, the list of sites to visit is low but this is a city that is just fun to wander, especially the Old Quarter. Ha Long Bay is one of Vietnam’s most magical sites. 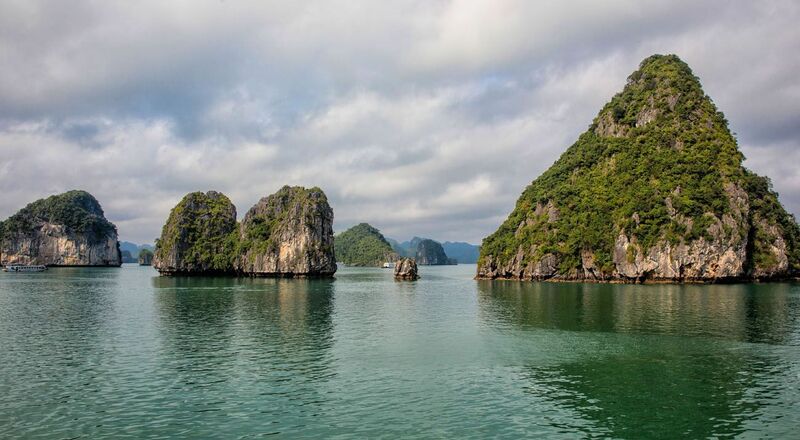 Towering limestone mountains are scattered through the emerald waters of the bay. Picking the three day cruise over the two day cruise allows you to journey deeper into the bay for a more memorable, authentic experience. Spend three days trekking through the misty mountains of Sapa. You can arrange your tour while in Hanoi or book your excursion in advance of your trip. From Hanoi, fly home or continue your travels. There are three more places that make it onto a lot of Vietnamese travel itineraries. You can add these if they sound interesting and if you have extra time to spend. Just note that if you follow our itinerary, you will spend 29 days in Vietnam. If you add in more time, you will have to get a different visa. Nha Trang: This is a popular seaside resort area. I did not include it since you get the beach experience on Phu Quoc and at Hoi An. Son Doong Cave: Located in central Vietnam, this is the largest cave in the world. 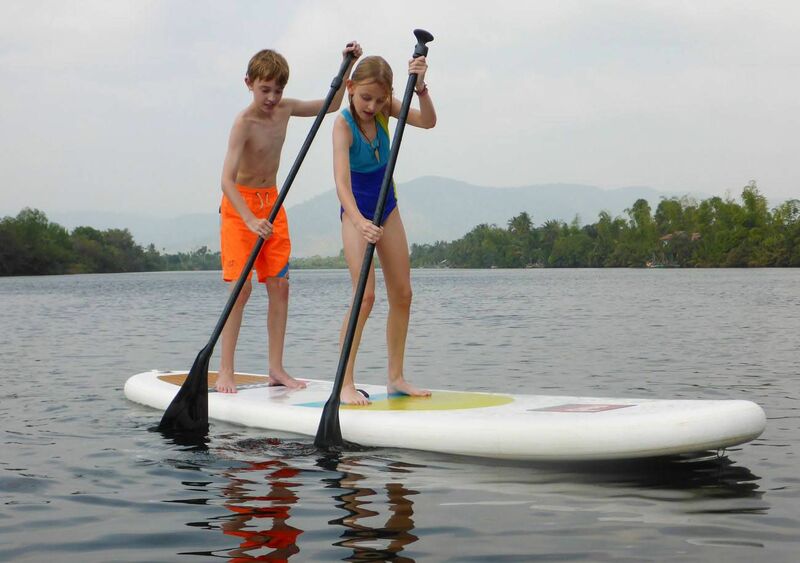 Dalat: This is a French hill town that offers relief from the sweltering heat of summer. Explore the waterfalls and relax in town. What Visas Will You Need? Visa requirements are always changing. We do our best to keep these posts updated with the most recent changes, but it’s always a good idea to double check the requirements for each country before you travel. I have included the links for each country in this post. Tourist visas are valid for 28 days. 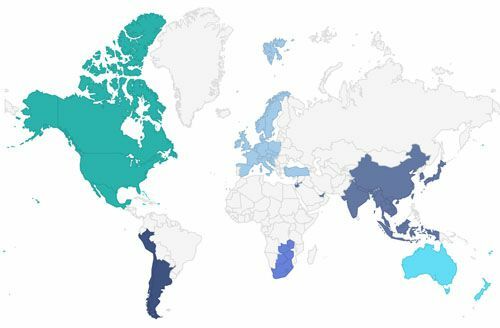 Citizens of 100 countries can apply online for an e-visa. The cost is $50. You will be emailed an approval letter, which you will show to passport officials when you arrive at Yangon Airport. You must travel to Myanmar within 90 days of when the e-visa approval letter is issued. Citizens of 57 countries (USA, Canada, Australia, New Zealand, countries in the EU, Japan, Israel, etc) who plan to stay in Thailand for 30 days or less do not need a visa. 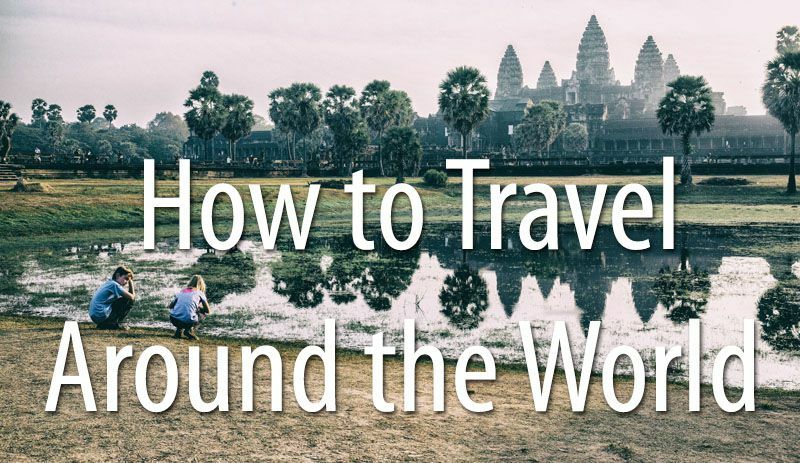 However, there is a gray area of whether or not you will need proof of onward travel (usually a plane ticket from Thailand to another destination). In this itinerary, since you are traveling overland between Thailand and Laos, you will not have this onward ticket. I read conflicting information about whether or not this onward ticket is really necessary. If you want to play it safe, I recommend that you get a 30 day Thai visa from the embassy in your home country before you travel. For more information, read this detailed post about Thai visas from Travelfish. What we did: We stayed in Thailand for 32 days so we got our visas in advance (at the embassy in Yangon, Myanmar). This is an easy one. When you cross the border between Thailand and Laos you will get a visa on arrival. The visa costs $30 – $42 depending on your country of citizenship and you can stay in Laos for 30 days. A one month tourist visas costs $30 and is obtained on arrival at the airport in Siem Reap. You will need one passport-sized photo. The Vietnam visa process is complicated. 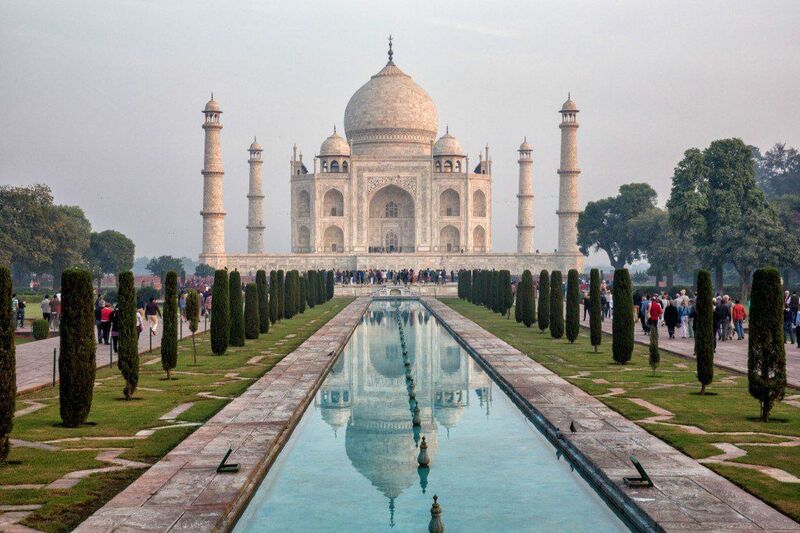 You will need a 30-day tourist visa, which costs $20, but the trick is how to obtain it. If you arrive in Vietnam by air, you can get a visa on arrival (VOA). However, if you follow this itinerary, you will arrive by land, so you cannot get a VOA. You will need to obtain your visa in advance. You can do this by applying directly at an embassy or by applying for an e-visa. For more information, read this post on Lonely Planet. To apply for your e-visa (if you are a US citizen), click here. What We Did: The e-visa was rolled out in 2017, after our visit to Vietnam. We obtained our visas in advance at the embassy in Bangkok. 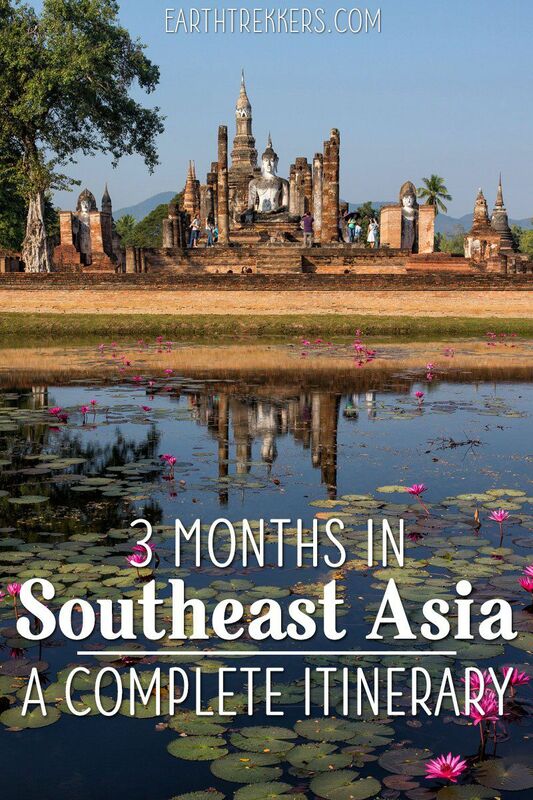 The best time to visit Southeast Asia is November through March. Temperatures are relatively cool and for the most part, it’s the dry season during this period of time. Peak season is the end of December into early January, when people take their winter vacations. At the end of March it really starts to heat up. April is typically the hottest month of the year. In May, the rain moves in. This cools things off a little bit, but expect rain showers from May through September. We started in Myanmar at the very beginning of December. We were in Krabi, Thailand over Christmas. Even though it was crowded and more expensive, it was magical being in Krabi for the holidays, especially for Tyler and Kara. We spent New Year’s Eve in Chiang Mai, another magical experience, lighting paper lanterns and watching them soar into the sky at midnight. During the entire month we spent in Vietnam, we got to experience the holiday season of Tet. From Hanoi, we traveled overland into China at the end of February. Are you planning a tour of Southeast Asia? 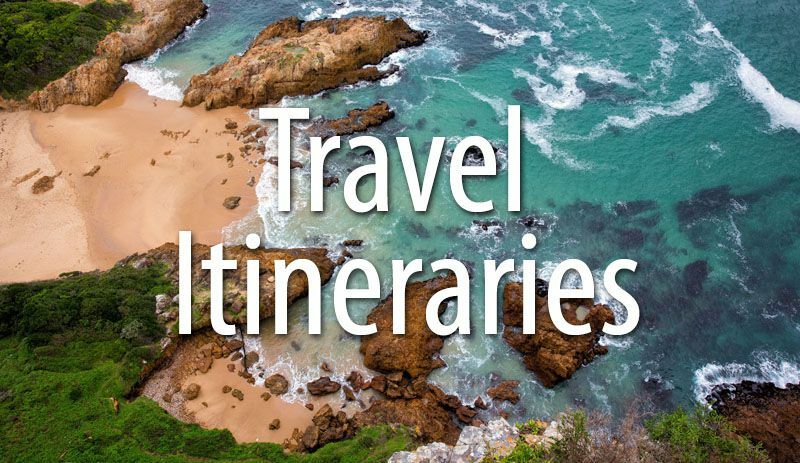 If you need help deciding where to go, how to change this itinerary to fit your needs, or travel advice, comment below! 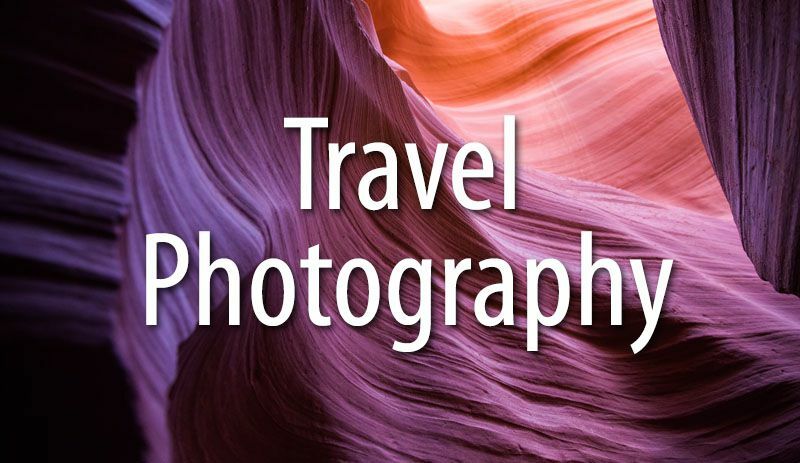 And if you have already toured Southeast Asia and want to add your tips and advice, we’d love to hear from you, too! Or, visit our Start Here page, for travel advice, to research travel destinations, and to find your next adventure. Thanks for this amazing itinerary. 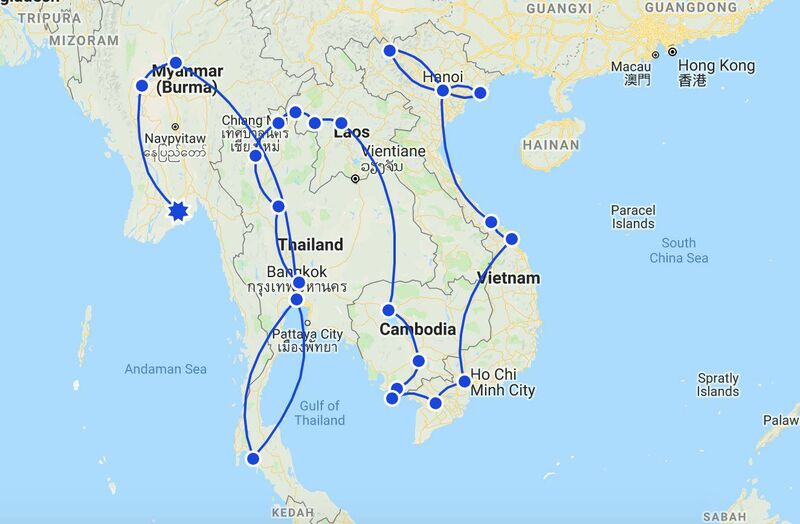 I am planning a solo trip around South East Asia starting in the middle of September until end of November/ beginning of December. Do you recommend this order of the itinerary considering the different seasons? I am not particularly interested in sunbathing but rather having more cultural experiences. Thinking of taking a trip in May with the family, 2 children both 14. Considering a 4 wk stay, KL, Singapore and Thailand or Indonesia? Don’t want to try and cram too much into the trip either. If we can find ways to save $$ would stay longer. Seriously looking into Airbnb to try and save. Thanks for this guide. 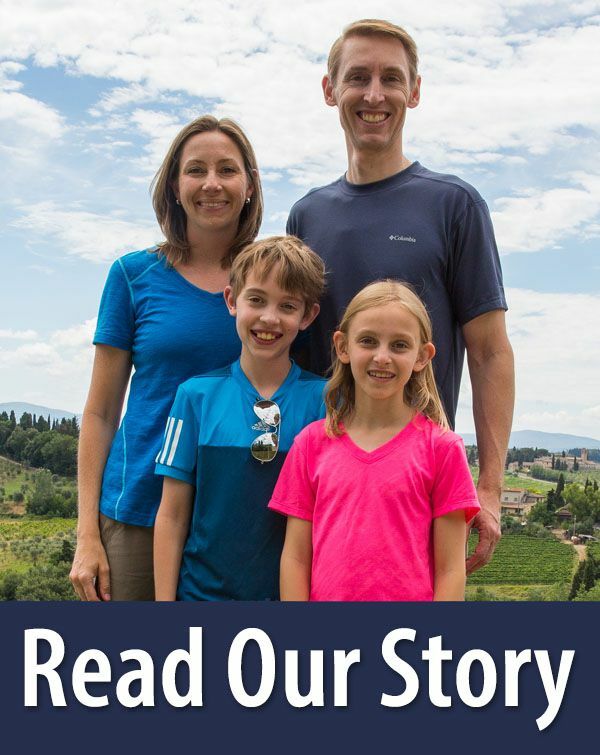 We have also traveled extensively with our family over the many years and are gearing up for a 4 month around the world trip. One question – did you have your kids on antimalarials? 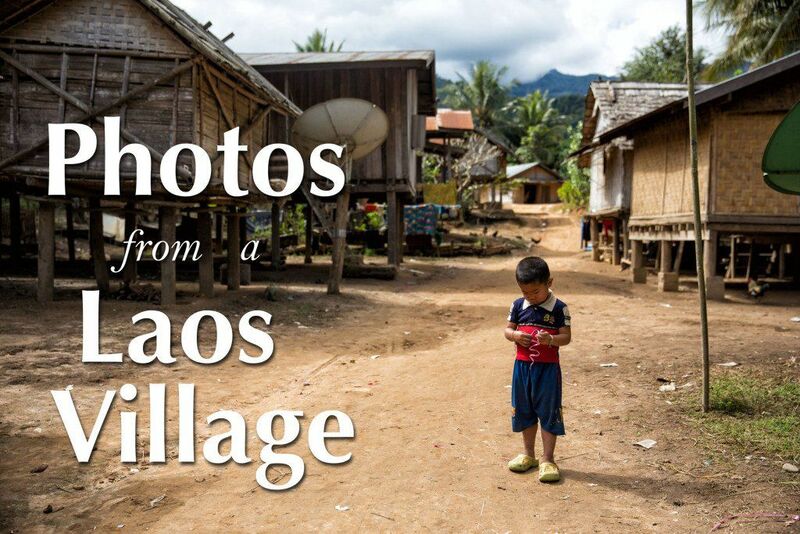 We are going to be in SE Asia in Jan-Feb — dry season, and not too remote locations. I am planning to travel to southeast asia on my gap year with a friend. We were planning to only go for two months however and would probably miss out Myanmar but would like to include Malaysia and Singapore. Do you think this would be possible and how would you recommend we adjust your itinerary? Oh!! Great! This post has involved every detail of SouthEast tour itinerary. It will help the tourists who are willing to explore SouthEast Asia. Myself and my partner have just booked a one way flight to Myanmar on 27th December. We are planning on using your plan as a rough guide. We have roughly 14 weeks to travel before needing to come home and return to work. If possible, could you give a rough estimation as to how much you spent during your 3 month trip here. Our first flight is already booked and paid. Hello Natalie. In general, we spent between $150 and $200 per day while in Southeast Asia. This price is for the four of us, including food, drinks, activities, transportation, and hotels. Some places were cheaper (like Cambodia and Laos) and some were more expensive (like Thailand and Myanmar). We did splurge on the hot air balloon ride in Myanmar and because it’s such a big ticket item, that was in addition to the average daily cost. Having some down time really helps the budget…the days where you just hang out, don’t do much, and maybe just go out for a meal or two. You have a very exciting trip to look forward to! I hope you have a great adventure! Very nice itinerary.. Nice family trip too, The information is so detailed.. I have a question.. What if our entry point in Bangkok Thailand? Our ticket is manila-Bangkok.. What should be the sequence of the 5 country tour? Thank you very much, Julie, Sure it will help me.